Vilax Manual Coder :Manual (Hand) Operated coder by which you can print Packaging Information like Batch No., Packaging/Manufacturing Date, Exp./Best before date, Net Weight, Contain, MRP Rs., Incl. all taxes & other information (just like Ink Jet Printer*) Directly on Top or Cap or Bottom or Side (Curve) of containers & box, Labels, Pouches, Corrugations etc. on a variety of packaging surfaces which includes cartons, cardboard, poly packs, polyethylene, cloth bags, plastic containers, auto and electronic components etc. This Manual Coder is lightweight, easy to use and a reliable hand-held manual coder, and comes with a self-inking printing area of 35mm X 22 mm & 50mm x 22mm. 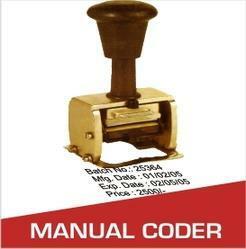 It is extremely handy, durable and an excellent solution for various types of manual coding. Manual Coder is widely used in the industry since it is a economically priced, low operating cost, maintenance free for overprinting & marking of different statutory items.